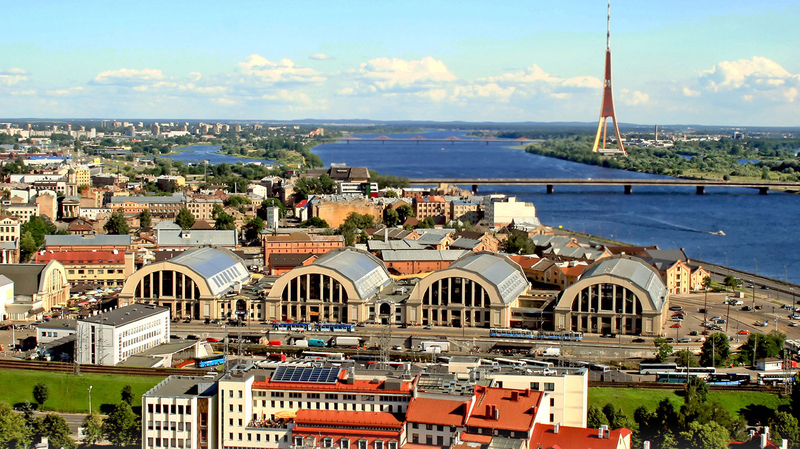 Search for the best flight prices from Manchester to Riga. Compare prices, book today and save money with Manchester Airport. Come to 800 year-old Riga and you can expect a World Heritage Old Town, extensive Art Nouveau architecture, cobbled streets and winding alleys, open, green public spaces – all topped off by a sea view. In short, Riga is here and waiting to be explored. Much of Riga’s accommodation is focused in and around the UNESCO World Heritage-listed Old Town. Among the options is the five-star Dome Hotel & Spa (Miesnieku iela 4) with its modern décor and opulent spa. Nearby, on the art nouveau-influenced Elizabetes street, the luxury boutique Hotel Bergs (Elizabetes iela 83-85) blends brown and cream tones with African art and feature fireplaces. For of a better sense of the city’s art nouveau heritage, book a suite at the four-star Hotel Neiburgs (Jauniela 25-27), a fusion of art nouveau artistry and contemporary cool. There are plenty of lodgings for those on a budget, including the sleek three-star Hanza Hotel (Elijas iela 7) that curves around Elijas street, while the friendly Ekes Konvent (Skārņu iela 22) guest house is perfect for those seeking local charm amid historic surrounds. Riga is one of the region’s prime shopping destinations due to its glut of independent shops and international brands. When it comes to shopping under one roof, the possibilities are almost limitless. Among the city’s many shopping centres is Galerija Centrs (Audēju iela 16), which lies at the heart of the Old Town and boasts designer names such as Gant and Diesel. Nearby, shoppers can enthuse over the shops and restaurants at Gallerija Riga (Dzirnavu iela 67), with its seven floors of boutiques. Those looking for Latvian-designed items should browse Green Studio Pienene (Kungu iela 7-9), an atmospheric outlet selling locally made pottery, textiles and cosmetics. For clothes, KLASE (Elizabetes iela 85a) is the place to go, with its chic collections from local designers. Riga’s restaurants are keen to showcase the country’s cuisine, and none more so than Kaļķu Vārti (Kaļķu iela 11a), which is at the forefront of contemporary Latvian cuisine with its use of locally foraged ingredients and farm produce. BIBLIOTĒKA N°1 Restaurant (Tērbatas iela 2) also stays true to local gastronomy with an inventive and varied menu. Alternatively, the quirky Restorāns Dārzs (Skārņu iela 9) serves good-value local fare in garden-like surrounds. Fish lovers will revel at the selection at Le Dome (Miesnieku iela 4), from herring to oysters, while those looking for fine wine and a few small plates should sample the tasty tapas at trendy Garage (Elizabetes iela 83-85). Passing some of Riga’s most iconic spots, this marathon attracts more than 20,000 participants. Runners start and finish on the picturesque banks of the Daugava River and can choose between full- and half-marathon or 5km or 10km distances. The climax of the Latvian National Opera’s season, this is a celebration of awesome arias and lively librettos through performances of classic and new operas. This festival celebrates the summer solstice, with events, markets, music and dancing. On 21 June, a midsummer market is held in the Old Town’s Dome Square where local delicacies can be sampled, while concerts take place alongside the Daugava River in the following days. Encompassing everything from music and dance to fairs and fireworks, Riga’s main cultural event last for three fun-filled days at venues throughout the city. Illuminations take centre stage at this enlightening festival, with colourful outdoor installations and projections showcasing the latest technology.